French President Francois Hollande said that everything will be done to vandals of Jewish and Christian cemeteries in France and bring them to justice. PARIS (Sputnik) – French authorities will do their utmost to find the vandals of Jewish and Christian cemeteries in France and bring them to justice, French President Francois Hollande said in a statement Wednesday. 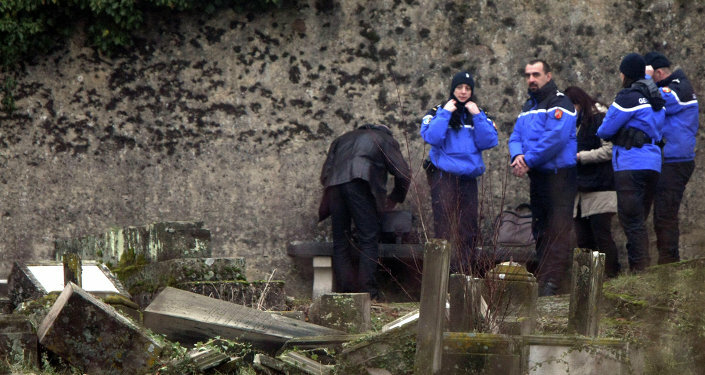 Over the past few days, France has faced two separate incidents of the desecration of graves. On Sunday, a group of teenagers vandalized a Jewish cemetery in the eastern French region of Alsace, damaging some 250 tombs. On Tuesday, dozens of gravestones at a Christian burial site in northeastern France were knocked down in a similar incident. Hollande strongly condemned the attacks and promised to find those responsible. “Everything will be done to find perpetrators and bring them to justice,” Hollande said in a statement. On Monday, French police detained five teenagers aged between 15 and 17 who allegedly were behind the attack on the Jewish cemetery. One of the suspects brought for questioning denied any anti-Semitic motives. If found guilty of damaging a cemetery for religious reasons, the suspects could face up to seven years in prison, French prosecutors say. Monday’s incident on the Jewish graveyard came amid heightened alert across Europe after radicalized Muslims killed 17 people in Paris in January. During the terrorism spree in Paris, four people were shot dead at a kosher food shop. Last weekend, two people were killed in a terrorist attack in Copenhagen, one of them near a synagogue.